Abit's BG7 is based on the i845G chipset and so it performed slightly better than other i845E based boards in most of the benchmarks. In terms of features the BG7 is a bit lacking however; supporting just on board 10/100 LAN and 5.1 audio (software codec). Most other motherboards in this roundup have IDE RAID, but that isn't the case here which is a real shame. 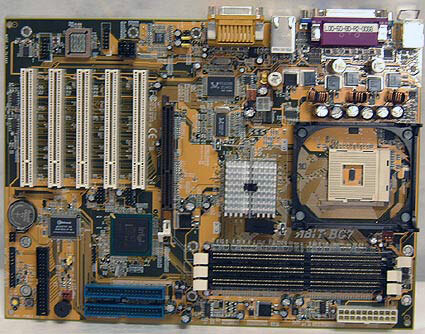 As with the very popular BD7II-RAID, the Abit BG7 is a small motherboard, measuring only half a centimeter wider then a GeForce4 Ti4600 is long. This small sized ATX motherboard shouldn't have a single problem fitting into even the most cramped desktop cases. The motherboard comes with on board Intel Extreme Graphics, and for those of us who actually like to play games, a 4x AGP (1.5V lock) slot is ready and waiting for a more powerful videocard. With five PCI's, you should have ample room for expansion in the future. The BIOS on the BG7 makes use of Abit's SoftMenu III and so it comes with all the tweaks we've come to love as overclockers and performance users. FSB options are adjustable in 1 MHz increments from 100-250 MHz and we have the ability to set and lock AGP/PCI speeds. Vcore goes up to 15% above stock values, and DIMM voltages goes as high as 2.8V. The BG7 BIOS brings to the table a whole host of neat memory features such as a 3/4 memory divider, and a 4/5th memory divider as well. This is extremely useful when overclocking as it can help provide more memory bandwidth to the CPU. There's nothing we really didn't like with the ABit BG7, except perhaps the placement of the IDE connectors. The BG7 faces a similar issue that the Epox 4BEAV also shares; those connectors come very close to the capacitors on the Ti4600.